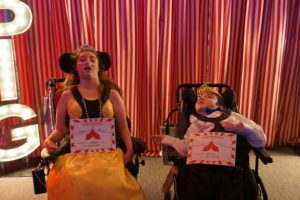 The Children’s Center Rehabilitation Hospital recently hosted prom for patients. This year’s theme was “Under the Big Top.” Scott Hines from KFOR-TV served as emcee and ringmaster of the ceremonies. Miss Western Oklahoma Mackenzie McIntyre, patient Dougie Blackbear, and Miss Bethany Megan Gold pose for a photo. Celebrity guests including University of Oklahoma football players, local media personalities, and local beauty queens served as prom pals for the patients. Chanse Sylvie, University of Oklahoma football player, served as a patients prom pal. This was his first time going to a prom and he loved dancing with his prom pal. Arwen and Quincy were crowned queen and king of the prom. “This experience was great. This was my first prom and I really enjoyed it. Kasiah and I had an amazing time. Her dance moves were much better than mine. I was anticipating her to get prom queen. I told her I would be back next year and we would win it together,” said Sylvie. “I love being able to help whoever I can. These patients brought me more joy today than I ever could have imagined. Parents were in attendance to take pictures of their children dressed in tuxedos and prom dresses. The girls had their hair and make-up done by a local salon in Bethany. Quincy Adams was crowned prom king and Arwen Anderson was crowned prom queen. “We loved bringing the experience of prom to our patients. This was a great day for them. They were able to focus on being a teenager and forget about their hospital stay,” said Jennifer Henry, special education manager, The Children’s Center Rehabilitation Hospital. To learn more about The Children’s Center Rehabilitation Hospital, or ways to donate please click here.